WASHINGTON (Reuters) - A federal judge on Tuesday contradicted the Trump administration's "incorrect" claim that no legal blocks remain for it to enforce a contentious policy to restrict many transgender individuals from the U.S. armed forces starting on April 12. In a three-page notice, U.S. Judge Colleen Kollar-Kotelly said an injunction that she issued against the policy in 2017 remains in place. "Defendants were incorrect in claiming that there was no longer an impediment to the military's implementation" of the transgender policy, the judge wrote. A spokeswoman for Pentagon said it was consulting with the U.S. Justice Department, which declined to comment. Three other injunctions issued by judges in separate cases have already been lifted, in part by a Jan. 22 U.S. Supreme Court decision and subsequent action by a federal judge in Maryland. That prompted the U.S. Defense Department to sign a memo on March 12 that would enforce its service limitations on transgender people, effective one month later. Kollar-Kotelly's injunction, however, had been set aside by a three-judge panel of the District of Columbia U.S. Circuit Court of Appeals on Jan. 4. The panel said it would hold off on issuing a "mandate" to finalize the higher court's decision until it resolves any request by the plaintiffs who challenged the transgender policy as a violation of the U.S. Constitution to rehear their appeal. 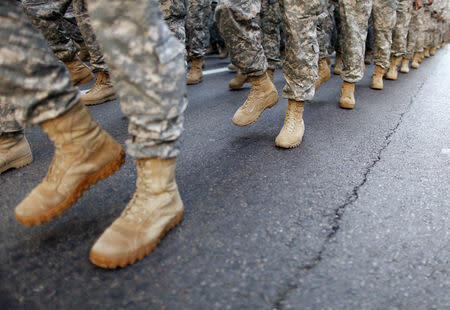 "The Trump administration cannot circumvent the judicial process just to fast track its baseless, unfair ban on transgender servicemembers," said attorney Jennifer Levi of the anti-discrimination group GLBTQ Legal Advocates & Defenders, who represents the plaintiffs. President Donald Trump in 2017 announced a plan to ban transgender people from the military, reversing Democratic former President Barack Obama's policy of allowing transgender troops to serve openly and get medical transition care. The Mattis policy also banned transgender people who seek or have undergone gender transition steps.